At the mercy of the scheming Imperial Chamberlain, Cleander, Rufinus is dispatched to Dacia, a land of untamed beauty at the edge of the Roman world, with orders to investigate the two legionary commanders there for signs of treason. Uncertain what to expect from his mission, the two generals, or the land itself, Rufinus travels east with Senova and his faithful hound, Acheron. 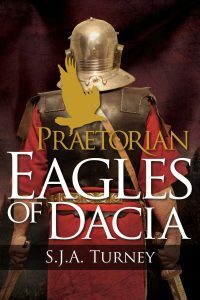 But machinations and skullduggery are afoot in Dacia, and the young praetorian is walking into the heart of empire-changing events. As the generals Clodius Albinus and Pescennius Niger work to put the province right following recent invasions and revolts, Rufinus begins his investigation, suffering insubordinate soldiers, unseen attackers and dangerous locals. At the edge of the world, Rufinus is about to stumble across a web that will put him in direct danger and threaten the empire to its core.